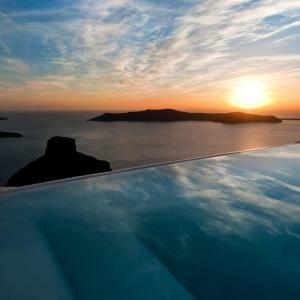 The resort of 5 stars Kapari Natural Resort, located in one of the best areas of Imerovigli, offers suites and traditional rooms with direct views of the caldera. 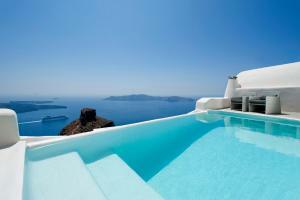 These rooms have a private balcony or access to a shared patio and offer typical Cycladic style. They include Duxiana beds and a flat-screen satellite TV. The bathroom has a careful design and includes a built-in shower. Some rooms consist of 2 levels. The premium rooms offer additional space, views of the volcanic caldera, pool by the door, seating area with sea views, built-ins, fireplace typical of the Cyclades islands, dressing room and bathroom with built-in rain shower. They have 2 levels or include whirlpool tubs. The spacious suites have a unique style and overlook the caldera. They offer access to a shared patio with a hot tub or are located near the pool. 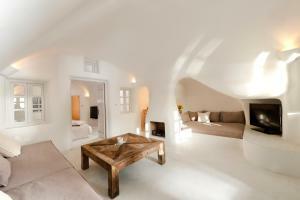 All suites include a sleeping area and a separate living area with a flat-screen TV and a Cycladic-style fireplace. They also have Duxiana king-size beds and a bathroom with hydromassage bath and integrated shower built in an artisan way. 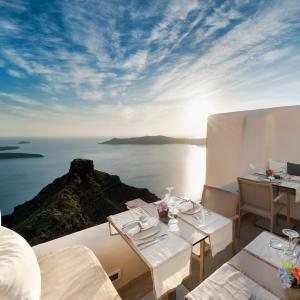 These premium rooms offer exclusive views of the Caldera from their private balcony, as well as a living area with integrated furniture, a traditional Cycladic-style fireplace, a flat-screen satellite TV and Duxiana beds. The bathroom, large and very elegant, includes an integrated designer shower. There is also an indoor hot tub. The bridal suite is spacious and elegantly decorated. It has access to a semi-private terrace with views of the caldera and offers a hot tub, a steam bath, a fireplace, a separate bedroom with a king-size Duxiana bed, an 2 flat-screen satellite TV, a kitchenette with a mini-fridge, fitness equipment and a free Wi-Fi connection. Wi-Fi free. The private bathroom has 2 built-in showers.